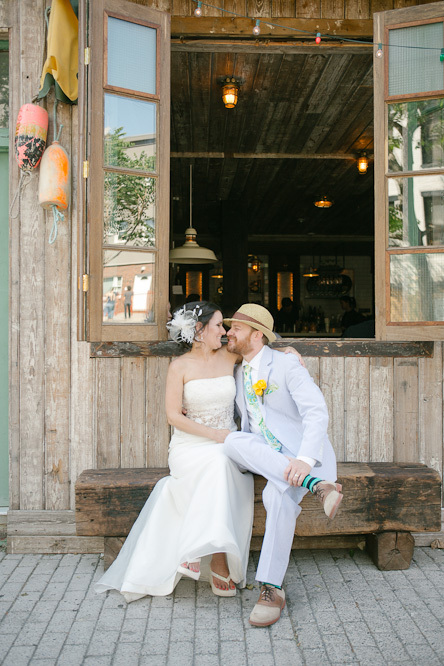 Alanna and Joe showed how personal and fun a small wedding can be when they chose their favorite neighborhood hangouts for their wedding and reception. Both sites were within walking distance of their Williamsburg, Brooklyn apartment. The ceremony took place at the East River State Park, across the river from Manhattan, and the reception took place about a mile away at the East River Bar. The couple’s favorite neighborhood Italian restaurant catered the reception. The entire event was informal and easy going. Guests who showed up at East River Park before the ceremony hung out and enjoyed the sun with other park goers or got something to eat at one of the food trucks adjacent to the park. Fifteen minutes before the ceremony, a party rental company appeared and set up chairs at a spot facing the river. A view of Manhattan on the far side of the river provided the backdrop for the ceremony. When a few guests arrived late, after the ceremony had already ended, the officiant, Joanna Fernandes, suggested that Joe and Alanna take the opportunity to renew their vows for the benefit of the late arrivals, which they did, a mere five minutes after the ceremony. 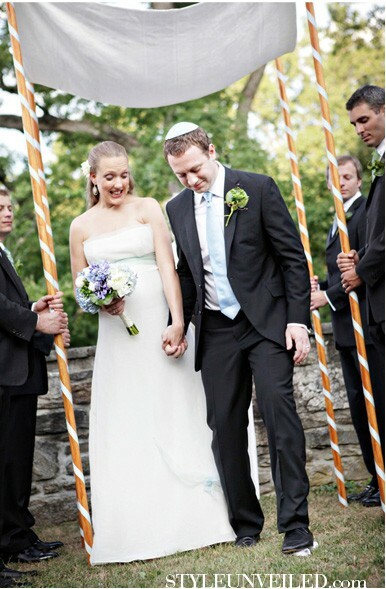 After the wedding, guests joined Alanna and Joe in walking to the reception. At midnight, the couple invited everyone back to their apartment for a star-gazing party on the roof. In planning their laid-back wedding, Alanna and Joe focused on sharing things they love and a few special details. 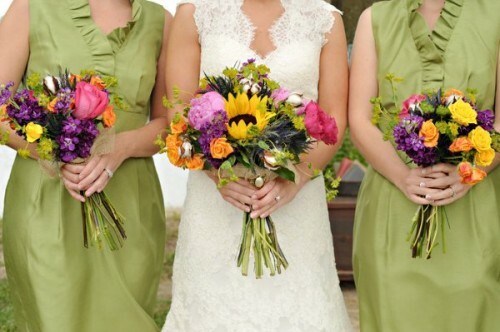 They claim that they fell into their sunny color scheme just by choosing the accessories they liked. The wide-ranging mix of colors came together because Joe’s boutonniere used the same yellow flower as Alanna’s bouquet, and Alanna’s sunglasses frames picked up the turquoise in Joe’s paisley tie. Thank you, Alanna, Joe, and photographer Jacob Arthur for sharing. Colors: A sun-splashed mix of orange, hot pink, yellow, and turquoise anchored with a touch of navy. 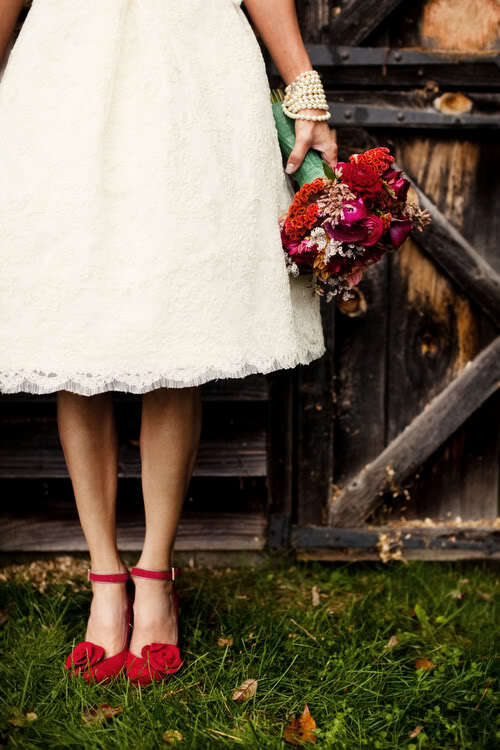 The bride wore: A lacy sheath, wedge flip flops, sunglasses, and a feathery fascinator in lieu of a veil. The groom wore: A navy seersucker suit, paisley tie, striped socks, and straw fedora. 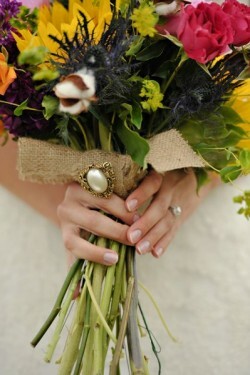 Flowers: A bridal bouquet and groom’s boutonniere DIY’ed by the BR’ide. Alanna explains that she put a shell from the beach where Joe proposed into his boutonniere: “Thank you, thousands of hours of cable wedding tv!” David Tutera would be proud. Transportation: Alanna and Joe reserved a limo for a ride to the park before the ceremony, but the trip to the reception was by foot. Guests with mobility challenges took advantage of taxis available outside the park. Reception decor: With the East River Bar’s evocative decor, Alanna and Joe didn’t need to do anything to create a festive atmosphere. 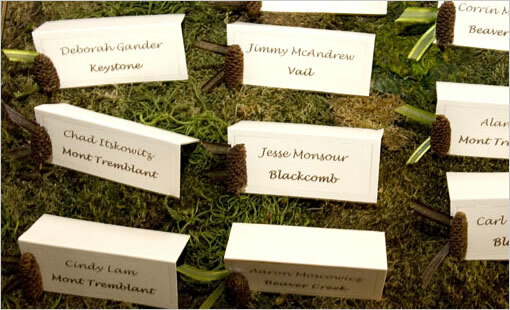 The only element they added were tent cards on the tables telling guests they had found the right place and listing the reception menu. What more do you need? Entertainment: Great conversation and the bar’s video games. Food:: A buffet of Italian specialties by Patrizia restaurant. To keep the buffet fresh, as well as to refresh the energy of the party, Patrizia delivered the food in four separate courses throughout the reception. This cozy wedding, set against a snowy tableau, was captured by Cronin Hill Photography of North Hatfield, Massachusetts. Captured Photography of Oxford, Mississippi photographed this backyard wedding of Emily & Andy of Louisiana in May 2011. 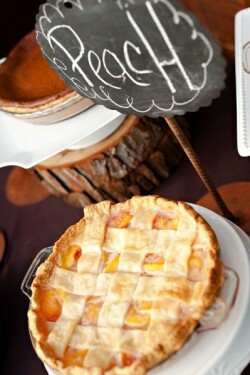 The styling is rustic with a light touch…and another pie dessert buffet – keep ’em coming! (see our peach pie recipe). This is the sixth hors d’oeuvre recipe in our kosher-fied royal wedding canape reception menu. 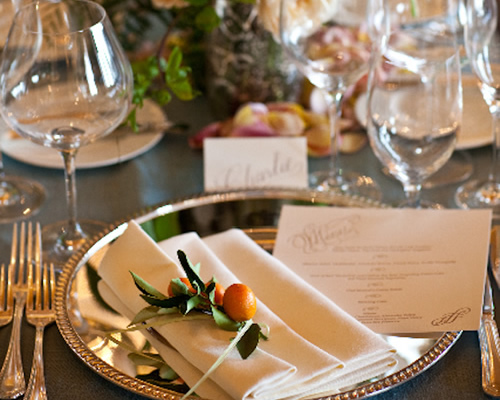 The total menu serves a 40-person reception. Will and Kate’s canape reception included smoked haddock fishcakes with pea guacamole. Haddock fishcake we do in traditional Jewish cuisine. The pea guacamole we will, like the Brits, borrow from Mexico. The fish cake comes from The New Complete International Jewish Cookbook , which has a lot of classic Jewish and classic American recipes for entertaining a crowd. The original recipe calls for 2 ½ diameter patties, but I’ve reduced the size to 2″ to produce patties that are more canape-size. That increases the yield to 75. See the next blog post for the pea guacamole. Wash and salt the fish and leave to drain. Cut the onion in 1-inch chunks and put in the food processor, together with the eggs, seasoning and oil, then process until reduced to a smooth puree. Puree the ingredients in batches is you need to. All the seasonings can be put into the same batch. Pour puree into a large bowl and stir in the matzah meal. Leave to swell. Cut the fish into 1-inch chunks. Put into the food processor, to fill the processor up to halfway. Process the fish in batches if you need to. Process for 5 seconds, until the fish is finely chopped, then add to the egg and onion puree. Blend with a large fork. Once all the fish is processed, mix everything together in the bowl with your hands. The mixture should be firm enough to shape in patties. If it’s very soft, stir in 1 to 2 tablespoons of matzah meal. If it’s too thick, rinse out the food processor bowl with 1 to 2 tablespoons of water and stir that in. Leave for at least a half hour or overnight under refrigeration. To shape, dip the hands into cold water and form the mixture into patties that are 2″ in diameter and 3/4″ thick. Fry in oil that almost covers the patties, or deep fry for speed. The patties can be served warm or cold. The cooked patties keep three days in the refrigerator. To re-crisp, heat in 350 degree oven for about 5 minutes. Cooked patties can be stored in the refrigerator for up to three days using the instructions in the recipe. You can freeze the raw patties up to 3 months. Start the freezing by laying them out in a pan, in layers separated by foil. After they are firm, transfer them to freezer bags. Defrost the patties in single layers on a board, overnight in the refrigerator or 1 to 3 hours at room temperature. To serve with the fishcakes: Pea guacamole. 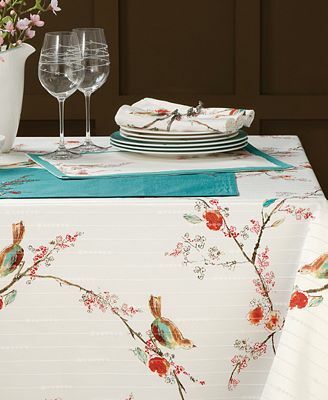 These instructions will give you a high-quality table runner. 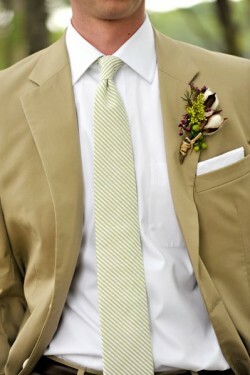 You can use just about any type of fabric: linen, cotton, velvet, whatever fits the style of your wedding. If you want to use the runner after your wedding and the fabric is washable, wash and dry it before you cut it. The length of the runner will be the total length of the table plus 30 inches. Buy runner fabric and lining fabric in a length that is a little more than half the length of the runner. (8 x 12") x 3 + 30" = 318" or 8.8 yards. Half of the length is 4.4 yards. In this case, buy 4½ yards of runner fabric and 4½ yards of lining fabric. Cut the pieces out of the fabric and lining as shown in the diagram below. 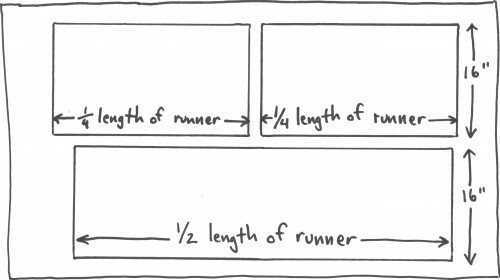 One piece should be half the length of the runner and 16″ wide. The other two pieces should each be a quarter the length of the runner and 16″ wide. For both the runner and lining, sew the shorter pieces to the ends of the longer piece with straight seams and the right sides of the fabrics facing each other. Use a 5/8″ seam allowance. Pin the runner fabric the lining fabric, right sides together. Sew around all four edges of the runner, leaving a 5″ opening. 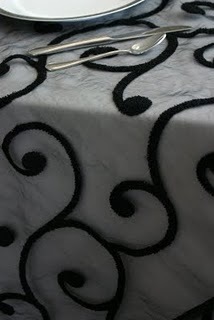 Trim the fabric at the corners of the runner. Pull the runner fabric right side out through the opening. Press the edges. Sew the opening closed by hand. Sew around the entire runner, 1/8 – ¼” away from the edge. 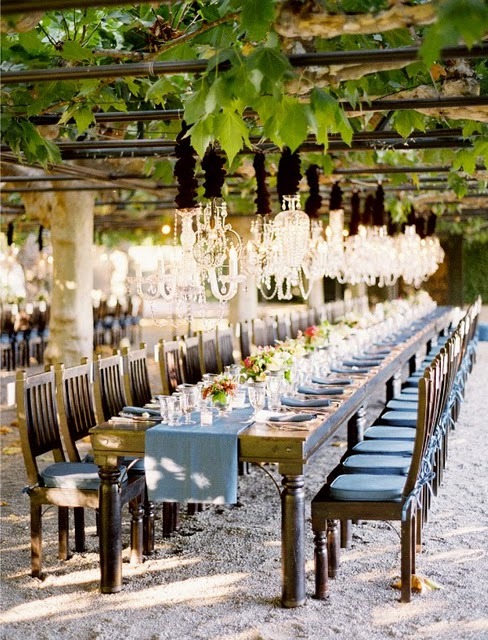 Long tables are increasingly popular, but the cost of filling them with decorations is not. You don’t need to fill the entire space along the middle of the table to create a stylish look. 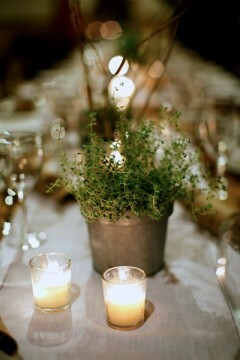 All this week I’ll be posting tips to create a stylish long tablescape on a budget. The key to making this approach visually interesting is to vary the heights of the different types of elements you use. 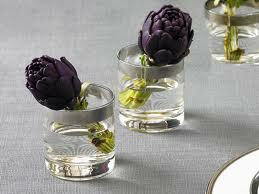 For example, if you use small flower arrangements, make the other element tall, like candlesticks or bread sticks standing in tall containers. 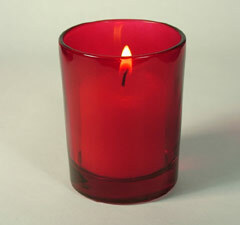 If the flower arrangements are tall or moderately-sized, alternate them with single blossoms or greens in low containers, small votive candles, or other small elements. The difference in height doesn’t need to be dramatic, but it should be notable. 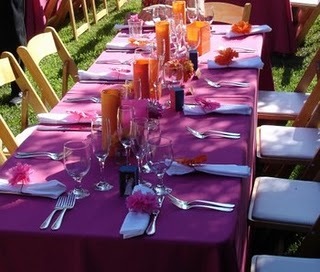 Take a look at these examples of a turquoise and orange table setting, at left, and the light blue table scape below. 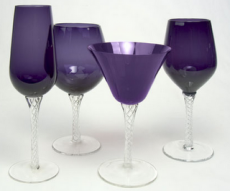 When selecting table linens, stemware, and even chairs, choose color. When a table isn’t piled high with decorations, colors and patterns can fill the visual field and go a long way toward setting your desired mood. Repeat a small element at regular intervals along the table. Natural elements work really well for this approach, but you can use any small object that builds on your theme or the feeling you want to create. 1. What is the width of the table? 2. How full do you want the table scape to be in the center? This can come down to how many flowers/candles you would like in the center of the table. Should it be a consistent arrangement (as seen in photos below) or do you want a little more “space” between the designs? 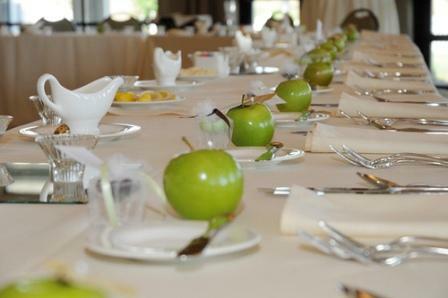 Are you serving family style so arrangements & food will be incorporated into the center – then your table scape needs to be a little less dense. 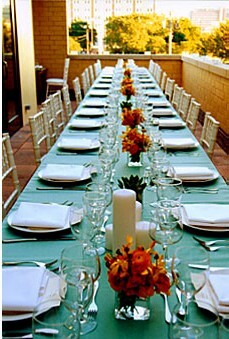 Long table scapes can be much more costly than a traditional single piece for a round table. So be aware that there is more product put into filling the center of your 6 foot or 8 foot table. As you can see in our photos below this is a “lush” design of florals, candles and natural elements so our budget per table is rather high. After I posted yesterday’s champagne punch recipe, I received several requests for a punch without alcohol. That’s a great idea. This refreshing citrus-y punch recipe is from The Kosher Gourmet Cookbook, by Mildred Miller and Bascha Snyder, now out of print. Like the champagne punch, this wedding punch is a wonderful white-glove vintage touch for your wedding reception, even without the white gloves. The original recipe calls for floating scoops of vanilla ice-cream in the punch bowl, but I removed the ice-cream to keep the punch parve. Also, the thought of guests ladling bits of ice-cream into glasses along with the liquid punch brings to mind a picture of punch splashing onto your guests’ clothing, which might distract them from how wonderful you look. Of course, if the ice-cream floats work for your wedding, go for it! If you put out a punch with alcohol as well as one without, label them with place cards or other appropriate notes. Combine the first four ingredients and mix well. When ready to serve, add the soda. You can mix the first four ingredients together the day before the wedding. Refrigerate the mixture. When you’re ready to serve, put the juice mixture into the punch bowl and add the soda. Champagne punch makes a great alternative to an open bar. It was once a popular party beverage among the white glove set. Set out a punch bowl at your cocktail reception to give your party a personal, vintage touch. White gloves optional. 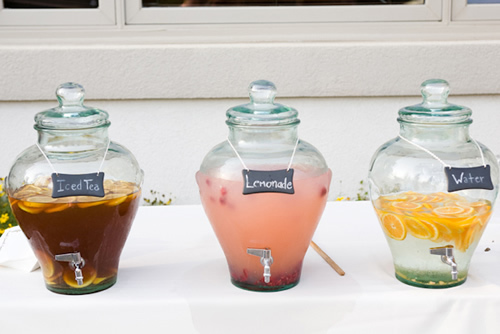 You can also set out a punch bowl of no-alcohol vintage wedding punch alongside the champagne punch. This recipe comes from The Complete American-Jewish Cookbook , by Anne London, a copy of which was given to me by my late mother-in-law. The book’s 652 pages tell you how to prepare just about every item of food on the planet. It was within arm’s reach practically the whole time I lived in Tunisia. Every Tuesday and Thursday I could buy whatever fruits and vegetables were available in the market, all gloriously in season and picked that morning, and I knew that when I got home this book would tell me how to prepare them. Between the fresh-picked produce and the meat from Braham’s kosher butcher shop, we ate well that year. Stir the sugar with the brandy, maraschino, and curacao to dissolve sugar. Pour over a block of ice in a punch bowl. Add and gently stir in champagne and mineral water just before serving. Mix the first four ingredients together before guests arrive, and have the champagne and mineral water on hand near the punch bowl to add when you’re ready to serve. Place bottom piece of 10-inch cake layer on serving dish. Slip 3 x 5″ pieces of waxed paper 1 inch under cake layer. This makes the paper easily removable when you are through frosting the cake and keeps the plate clean. Spread a ½-inch layer of filling on top of bottom piece. Place top piece over it and frost entire layer. Scatter 1/3 cup ground hazelnuts on the waxed paper segments. Lift paper gently and toss nuts onto cake. Repeat until all the nuts are used and remove paper. Put this layer to the side. Use the same method to frost the 6-inch layer on a separate plate. Frost the edges of the cardboard, too, and use the remainder of the ground nuts. Refrigerate the layers until a few hours before you plan to serve it. When you are ready to complete cake, cut 4 pieces of straws the height of the 10-inch cake layer. Place the straws into the cake in a circle, each about 2 inches away from the center. Place the 6-inch cake layer on top of the 10-inch layer. The cake layers can be frozen for 2 weeks. Move them to the refrigerator 24 hours before you need them. When you freeze the cakes, put them in the freezer uncovered for an hour to set the frosting, then cover them very well. This frosting and filling recipe goes with the hazelnut wedding cake recipe we started in yesterday’s post. These ingredients make enough frosting and filling for two 10-inch cakes, so you will have a generous amount of frosting for your 10- and 6-inch tiers. I’ve broken down the ingredients into two batches to keep the volume of whipping cream easy to handle in a home kitchen. In a large bowl, whip 1½ cup non-dairy whipped cream substitute until it begins to thicken. Add 1 Tbl sugar and 1 tsp vanilla. Continue to whip until it forms peaks. Next post: Assembling the cake. This cake recipe comes from a cookbook published more than 25 years ago called “The Kosher Gourmet Cookbook”, by Mildred Miller and Bascha Snyder. I love that the book’s recipes and styling come right out of the era when a woman’s baking ensemble included a calico apron and pearl necklace. 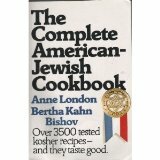 There are chapters titled “Luncheons”, “Teas”, and “Cocktail Parties” along with “Saturday Afternoon Kiddush”. My copy has passed through many hands. One of my brothers bought it for me from a library book sale when I was studying for my conversion to Judaism. I’m glad my brother rescued it from the book sale and I can bring this recipe to you today. The original recipe is for one 10″ round cake. I’m recommending that you make two of these cakes and cut one down to 6″ diameter. 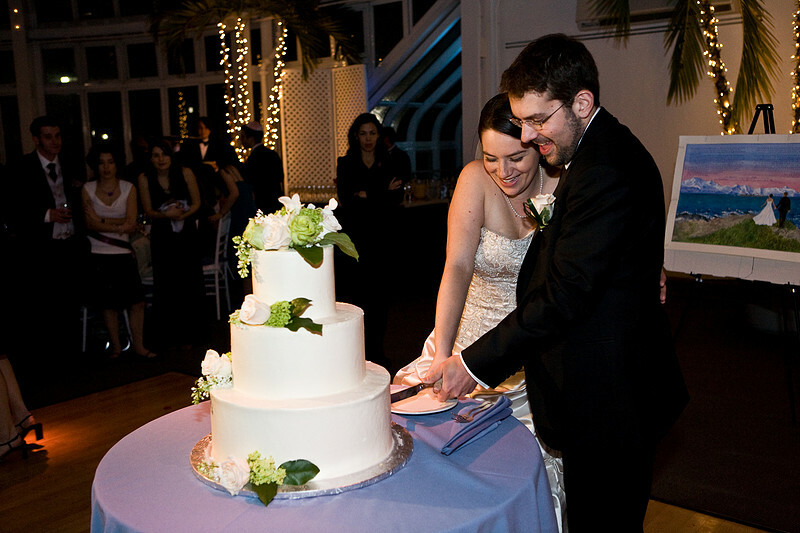 That will give you a traditional two-tiered wedding cake that serves 50 people (Wedding Cake Size and Servings Chart). Constructing the cake involves cutting one of the 10″ cakes down to 6″, resulting in some unused cake, but I’m going to trust that you can put the trimmed pieces to good use. You will need a 6-inch diameter circle of currogated cardboard. Buy one from a craft or party store or make one of clean cardboard and wrap it in aluminum foil. Tomorrow I’ll post the frosting recipe and instructions for assembling the cake. Serves 50. There are enough ingredients to make two 10-inch cakes. These instructions make one cake. You will need to make 2 cakes total. Separate 6 of the eggs, putting the yolks into a large bowl. Add one whole egg. Beat for 10 minutes until thick and light yellow. Gradually beat in ½ cup sugar, 1 cup ground hazelnuts, and 1/3 cup bread crumbs. In another bowl, beat 6 egg whites until foamy. Add ¼ cup sugar, 1 Tbl. at a time. Continue to beat until the whites form stiff peaks. With a spatula mix gently one-fourth of the whites into the hazelnut mixture. Sprinkle 1 tsp. flour over mixture and gently fold in the rest of the whites. Grease and flour a 10-inch spring-form pan. Pour batter into pan. Bake at 275° in the middle of the oven 35-40 minutes, until it shrinks away from the sides of the pan. Immediately remove the rim of the spring-form and let the cake cool on a rack. Slice through the cake horizontally into two equal layers. Use the cardboard circle as a template to cut one of the cakes down to 6″ diameter. While contemplating a guest list, many couples are faced with the question of whether or not to invite children to their special day. If this is a problem for you, then you might consider the following: however well behaved the children are, they might get excited during the event and disrupt an intimate environment. Children also mean more people, meaning that food prices would be brought up, a particular issue on a small budget. Depending on your venue, you might need to child-proof the area, meaning extra stress and nerves. Although these reasons hold true, children create a homey, family-like atmosphere. Finding children a babysitter is tricky, so families might be more likely to come if they can bring their children with them. 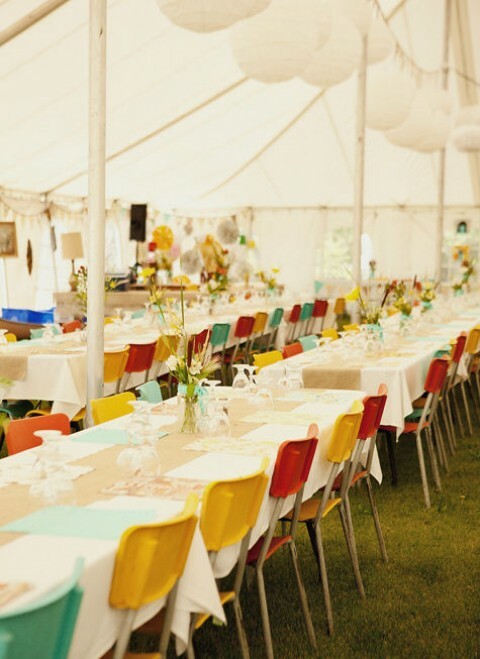 If you are going to invite children to your wedding, then you may need an activity for the kids to engage in, so as not to disturb the occasion. One idea is bubble bottles. If you are having an outside wedding, then bubbles are an ideal way to occupy children while causing no damage to the wedding. 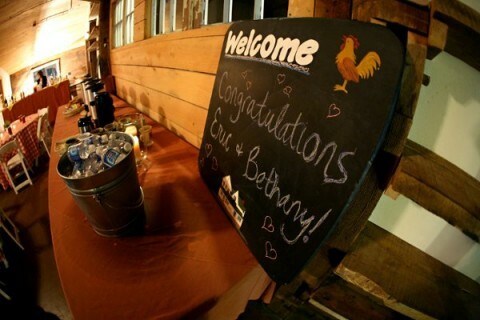 You could also have a small table where kids could draw pictures and write cards of congratulations. If you put them into a scrapbook, these pictures could be a memento for years to come. 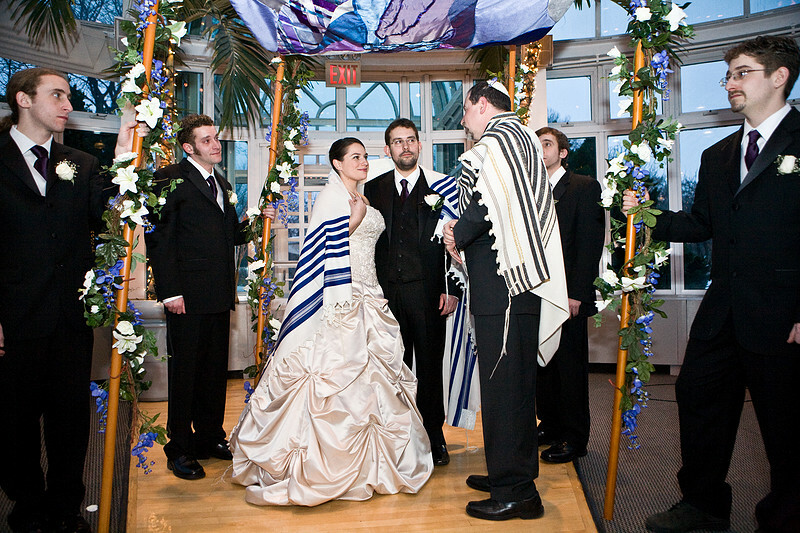 After yesterday’s post about using kippahs and bentschers as wedding favors, I’ve been asked if I know of a good vendor for kippahs – something good quality and easy on the wedding budget. I’m happy to tell you about the vendor I used just a few months ago for my daughters’ b’not mitzvah: Yofah. I had a great experience with them. Yofah offers the widest selection of colors and fabrics, and the best prices, of any other kippah vendors I found. Their online system for personalizing the inside of the kippah with text in English and Hebrew is easy to use. And when the kippahs arrived, I found that the quality was very good. BTW: Let me share with you the kippot style my daughters chose for their b’not mitzvah: fuschia satin. I just love them (the kippahs and the girls!). 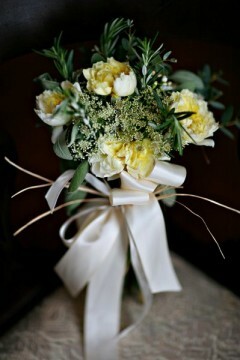 After the weddings with huge and opulent flower arrangements come the small and simple ones, with less quantity. Tables should be long and elegant instead of round, because long tables not only emphasize the decoration but are also reminiscent of other times, when they were part of homemade family celebrations. 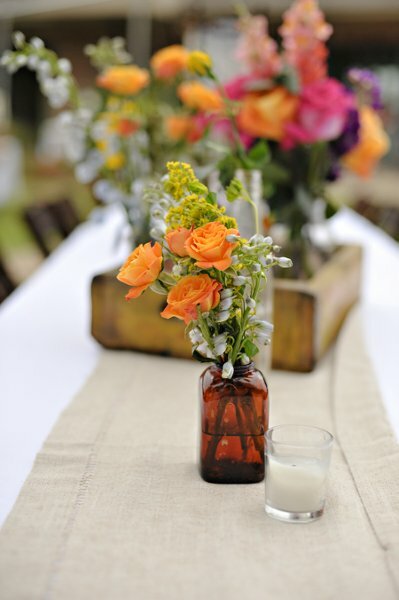 Must trends: include country flowers, recycle small glass recipients (such as yogurt or mason jars) and tin tea cans, create an eco-chic and rustic ambience for the wedding, which is simultaneously original and elegant. 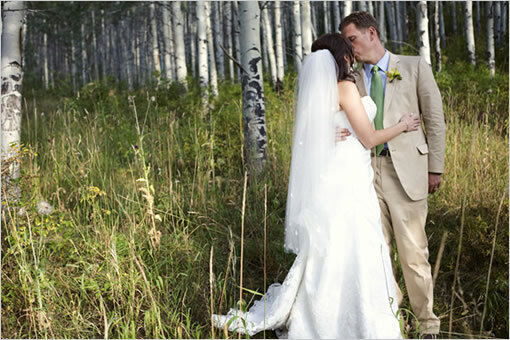 The weather is hard to predict, but outdoor weddings are a huge trend for 2011 because a party in the outdoors is different, fun and relaxing. 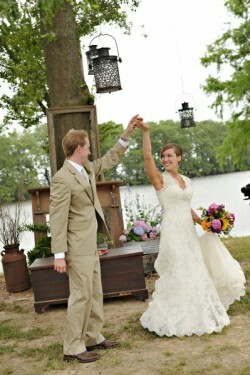 If it’s possible to make yours an outdoor wedding, than do it! 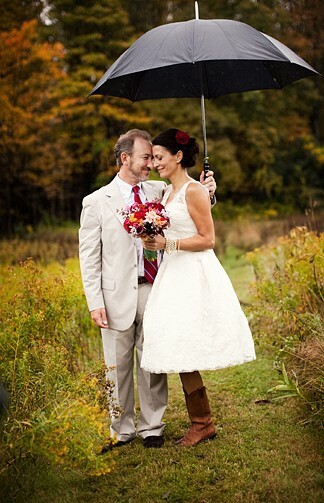 However, it’s very important that you have a plan B, just in case the rain decides to bless your big day! The past is back and all vintage ideas as well. Incorporating modern elements that have a historical past is a growing trend, which is very appreciated by everyone that participates in weddings with these types of ideas. Presenting your guests with party favors from historical brands, building the wedding theme around this concept, recycling and wearing your mother or grandmother’s wedding dress, incorporating your parents’ or grandparents’ wedding pictures into the décor, creating an atmosphere of nostalgic romance is always nice and very, very trendy these days. Details are hardly overlooked but now they are more important than ever! No tiny detail should go unseen and everything should be planned right down to the last feature. If you don’t have time for details, there’s nothing like hiring a wedding planner to transform your wedding dreams into reality. The wedding cake table is a main focal point, the place cards should be original and personalized, the chairs should have a special touch, the wedding color palette should be very well thought out – basically, think about all the small details that will make a big difference. The DIY concept – Do It Yourself – is definitely here to stay and it’s one of the biggest 2011 wedding trends, not only from an economical point of view, but also because there isn’t anything more special than incorporating handmade elements – made by the bride and the groom – into the wedding. 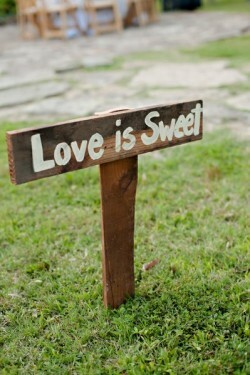 Photography is going to take a vintage spin, with wedding albums that are reminiscent of the seventies. Draped textiles as backgrounds for photographing the bride and the groom, as well as guests, in a relaxed setting is a big trend, so don’t forget to set up something like this at your wedding: it’s very simple and, best of all, loads of fun for everyone. 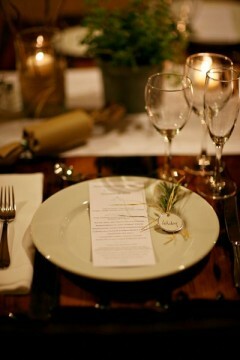 Just as weddings in general are going to be simple and pretty in 2011, so should the menu. Traditional food presented in a very modern way or with a touch of originality is the way to go. Serving lemonade, mazagran, colorful teas – all in a special way – is definitely a very pretty trend. 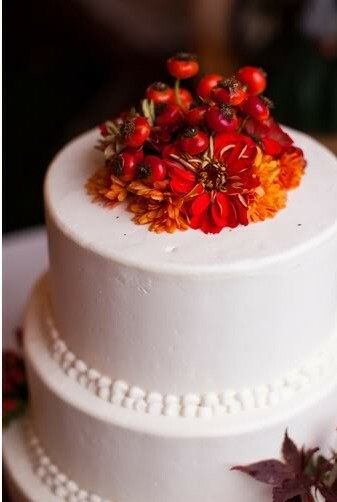 Wedding cakes will continue to be tall and elegant, but with a touch of rustic-chic, where fondant is replaced by a delicious butter cream and large sugar flowers are substituted by natural flowers, sugar glazed fruit or just fun details. 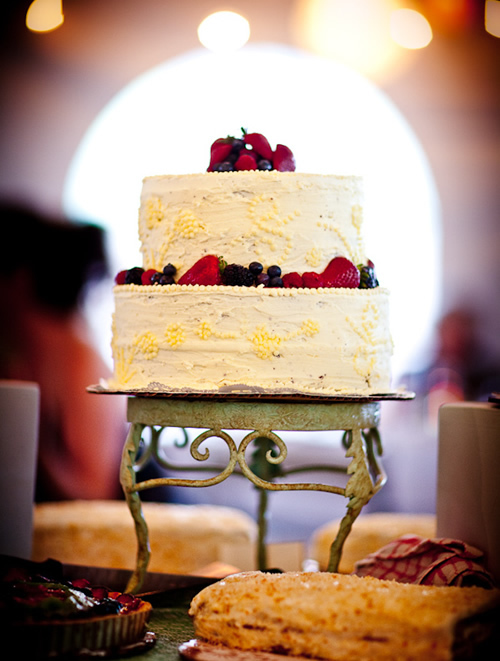 The wedding cake table is a huge trend: it should be beautiful and a highlight at the reception venue. Miri and Hank share a deep sense of engagement with the environment. 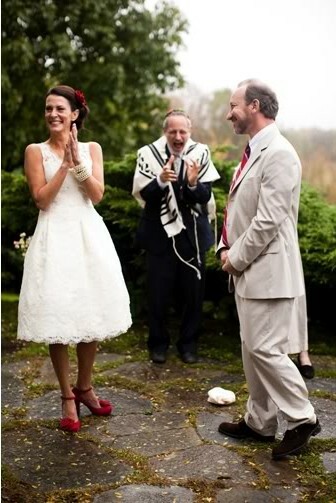 The couple met through Habonim Dror, a youth-movement that supports making green choices. “We spent many summers at camps enjoying the beauty of nature.” Because of this, Hank and Miri strongly support environmental causes. When it came time to make their love for each other official, they were not going to leave their love for nature behind, but they were planning to marry in the middle of January. 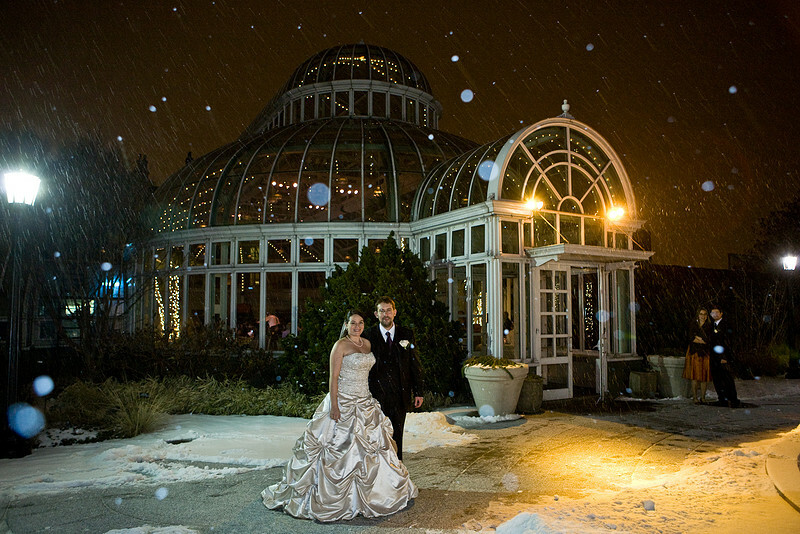 How to have a garden wedding, surrounded by the natural environment they both love, in the middle of winter? The answer: Miri and Dan celebrated their wedding in the middle of New York’s Brooklyn Botanical Gardens, at the Palm House, which resembles a conservatory with its large pane windows on the gardens — and night sky — outside. 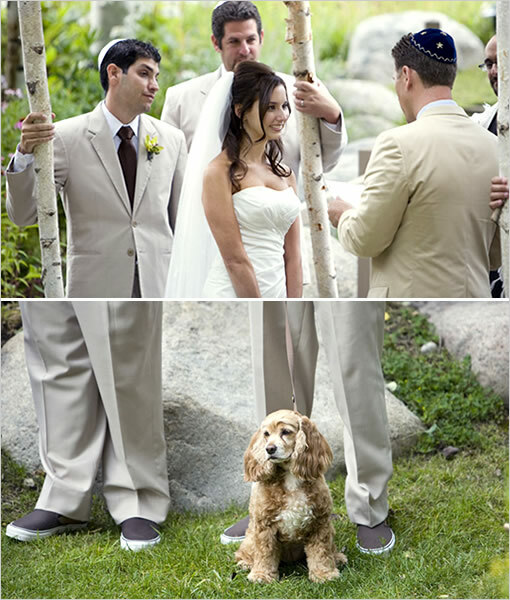 Carrie and Ben raised their huppah in an alpine forest in Beaver Creek, Colorado, outside of Denver. 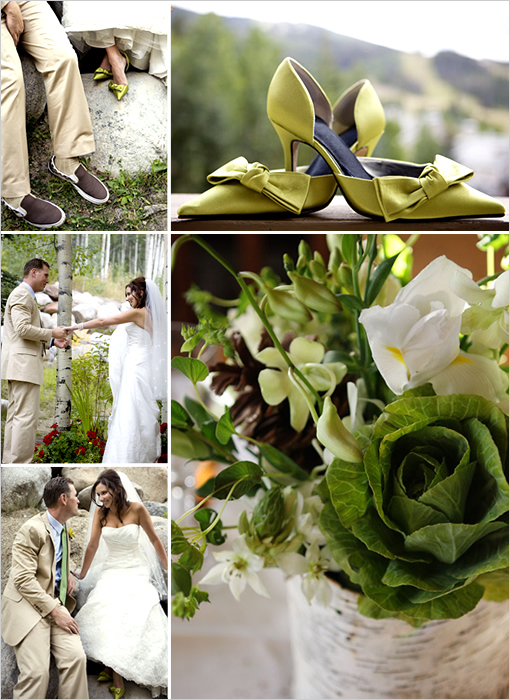 For their color scheme, they chose brown and a very refined shade of green. 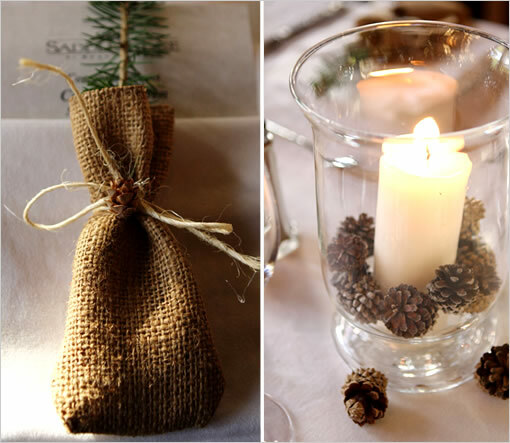 The natural elements in the decor, including pine cones and wildflowers, are used with restraint, so that we can appreciate their natural beauty. 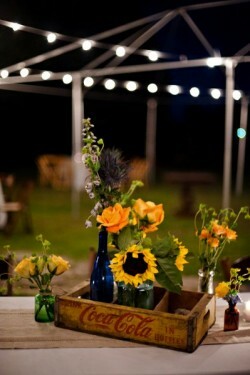 If your home is a 300-year-old barn, your backyard wedding will naturally take on something of a country theme. 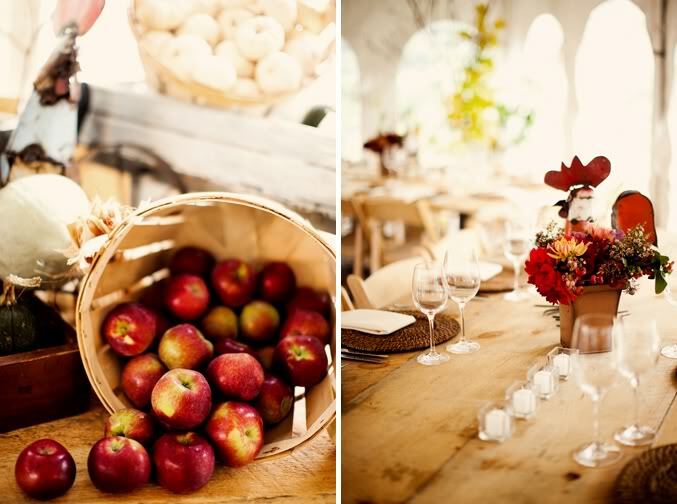 Jan and Rob played the opportunity for maximum impact, with the prominent use of reds in the color scheme and reception decor that evokes a country store. 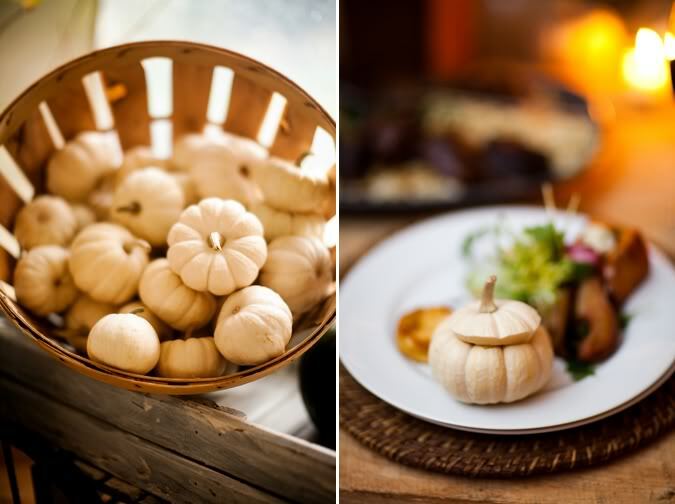 Even if your home isn’t a 300-year-old barn, the details of Jan and Rob’s celebration will serve as great inspiration for your autumn wedding.